4 of Swords: Purrrr…. I’m napping right now. I like to rest and have deep thoughts. Contemplation is one of my favorite things to do. Aside from sleeping. 10 of Chalices: I’m an expert snuggler. I love to help create a happy home. Harmony and alignment are my specialties. 3 of Chalices: I only come out when friends are around! I’m here to be a travel companion and to guide your friends and community. Just don’t call me an emotional support animal! What are you here to teach? The Magician: My abilities to share knowledge will spread magick to others. I will teach you and your friends to learn more about your inner powers, skills, and to find your own answers. And I’ll teach the world to love cats, of course. Mrow. Hierophant: You, the hooman tarot reader, must establish yourself as a trusted tarot interpreter. Together we will uncover the mysteries of daily life for yourself and others. I’ll bring the catnip. 9 of Chalices: If we work together, we can grant wishes. Bowls and bowls of tuna can be ready for us to feast upon. Satisfaction and happiness is in the future! Mreh! I cannot be defined. Sometimes I am a gorgeous longhaired Persian requiring grooming and maintenance. Sometimes I am a black cat deeply in touch with the occult. And at all times, I am the QUEEN of the house, so don’t forget that. What matters most is that in my heart, I care about others and I want to be an inspiration. I think this deck will require lots of petting, I mean shuffling, to make sure it gives concise answers. But I love it’s compact size and it’s already in my backpack ready to go on adventures! 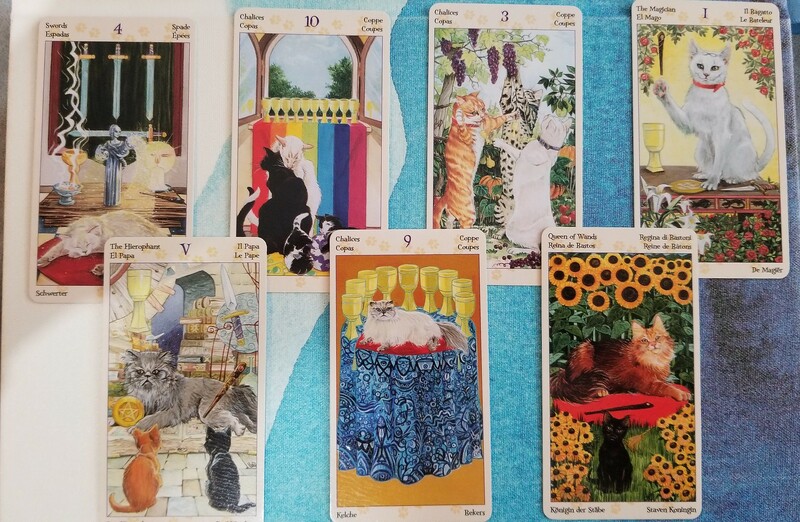 Who wants a reading from the Cat Deck? ?